Okay so this isn't quite Day 2 but I swear I did do this on the second day, I just haven't had time to take before and after pictures. Its not as big a project as the bath but at least I was able to organize this kitchen drawer which serves as a regular catch all for anything and everything small enough to fit into it. I know it still looks a bit messy but it is actually more organized. Really! I found a small container that my daughter borrowed for her 'treasures' that I found just laying unused in her room so I took it back and used it to put all her hair accessories in. Since I usually end up doing her hair in the kitchen during breakfast, I decided to put it all there in the drawer where I can get at it easily. 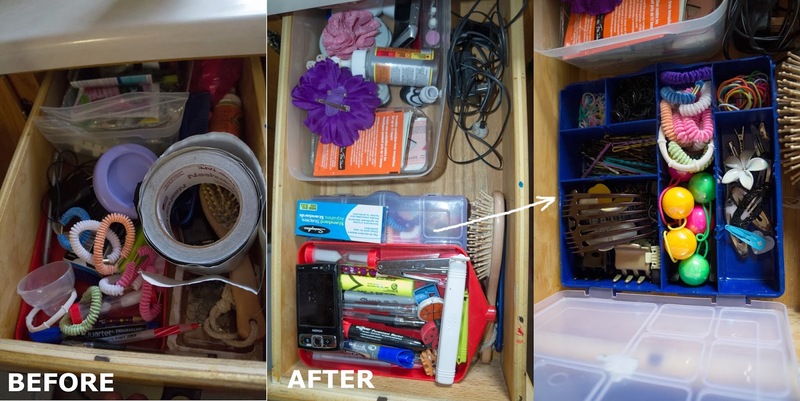 I mean, the catch-all drawer already had a brush and comb in it as well as various rubber bands, why not the whole hair accessories thing right?